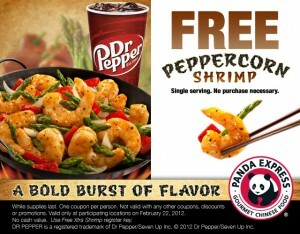 Free Peppercorn Shrimp at Panda Express Today 2/22 | A Savings WOW! Panda Express’ Peppercorn Shrimp is their first Wok Smart™ shrimp dish. Today, you can get a free single serving. Just visit their Facebook page, print out the coupon, and bring it to your nearest Panda Express location. Find your nearest Panda Express location.